Steam engine “Klondike Katie” welcomed her first guests to Rebel Railroad in 1961. The regional park boasts a unique blend of down-home country charm, top-tier entertainment, family attractions, and unstoppable thrills. Dollywood has welcomed visitors since it opened in 1986. However, the rich history of this park actually begins a quarter- century earlier, at the start of the 1960s. And like many classic theme parks, the story begins with a train. Banking on the success of their first tourist attraction, Tweetsie Railroad in North Carolina, entrepreneur brothers Grover and Harry Robbins built a train ride and roadside attraction for tourists visiting the Smoky Mountains. The 3-foot, narrow gauge railroad travels a 2 ½ mile route from the foothills to the top of a mountain and back again. Their locomotive, named Klondike Katie, was one of the famed White Pass steam engines that had once carried supplies between towns in Alaska and the Yukon Territory. The Robbins brothers named their new attraction Rebel Railroad, themed after a Civil War era Confederate village with a general store, blacksmith, and saloon. Rebel Railroad later caught the eye of Art Modell, owner of the Cleveland Browns at the time. Modell purchased the park and reopened it as Goldrush Junction in 1970. With existing Old West theming as a stepping off point, new attractions and buildings expanded the park’s train focus to include logging and gold mining themes. At this time, park additions included children’s rides, entertainment venues, and panning for gold. With the acquisition of the Log Flume from the 1964-65 New York World’s Fair, the park rolled out its first big thrill experience. In 1976, the park simplified its name to Goldrush, but the change was brief. The property had been purchased by Jack and Pete Herschend with plans to expand their successful theme park and entertainment brand into the state of Tennessee. Renamed Silver Dollar City, Tennessee, the park opened in 1977 as the sister park to Silver Dollar City, Branson. The Herschends then invested in park improvements that further developed its lush presentation of the Appalachian way of life. Tapping into the talents of the local artisans and craftspeople, the park environment invoked a simpler time, when butter was churned at the local dairy farm and soap was made by hand. Visitors to “Craftsman’s Valley” could see many of their souvenirs being crafted in front of their eyes. Several new rides, shops, and shows were added, filling out the park’s offerings for a widening audience of visitors who came from across the region to celebrate and embrace the local flavor. Dolly Parton stands in front with just some of the thousands of workers who helped to build and operate Dollywood in this 1986 photograph. While Silver Dollar City, Tennessee grew, another local entrepreneur was pursuing dreams of her own to draw tourism to the Smokies. 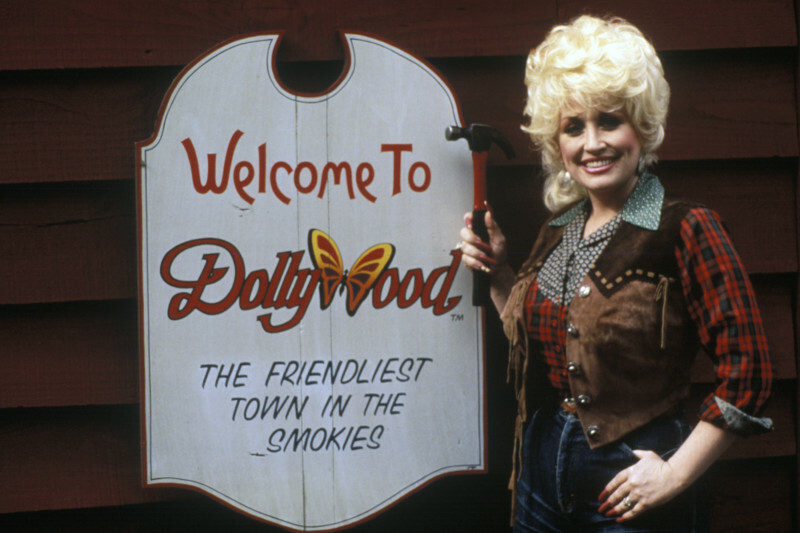 In the early 1980s, entertainer Dolly Parton began publicly expressing her desire to build a theme park enterprise in her own hometown that would create opportunity for the people living in the Smoky Mountains. (Dolly’s hometown is Sevierville, TN, seven miles from Pigeon Forge.) By that time, Dolly had achieved superstar status as a singer, songwriter, and actor. Her popularity boosted her chances of success in the new venture. Sharing similar values and goals for creating quality entertainment while boosting the local economy, Dolly and the Herschends joined forces. On May 3, 1986, Silver Dollar City reopened as Dollywood with national fanfare worthy of the superstar’s fame. Under her leadership, entertainment became the new defining factor for the park. Dollywood attracted a broad variety of musical acts from country and bluegrass, to classic rock and Southern gospel. Dollywood guests encountered live entertainment everywhere they turned, including roving musicians, cavalcades, and full-scale theater productions. The focus on quality entertainment led to the creation of Dollywood’s Smoky Mountain Christmas, the park’s wildly popular holiday festival that expanded the seasonal park’s operating calendar through the end of the year and greatly impacted the local economy. In the ensuing decades, Dollywood has steadily expanded to offer new themed areas with some of the world’s highest rated thrill rides, as well as Dollywood’s Splash Country® Water Park, and Dollywood’s DreamMore Resort and Spa®. Dollywood also operates seven dinner theater attractions across the country, extending the park’s physical presence well beyond the park boundaries. Coaster enthusiasts worldwide consider Dollywood a must-visit for many of its record breaking thrills. Thunderhead, a twister designed by Mike Boodley of Great Coasters International, was the park’s first wooden coaster. Its success set the park on track to add more coasters over the years, including rides designed by Gerstlauer and Bolliger & Mabillard. In 2016, Rocky Mountain Construction built Lightning Rod, said to be the world’s first launching wooden roller coaster and currently ranked the fastest wooden coaster in the world. Wildwood Grove, Dollywood’s largest expan- sion to date, opens the summer of 2019. Today, as Dollywood enters its 34th season, its largest expansion ever is being unveiled in a brand-new, themed area titled Wildwood Grove. Guests will soon be able to explore and adventure in its 6.5 acre, woodland area surrounding a six-story- tall, internally lit tree that changes throughout the day to tell daily and seasonal stories. Phase one of the $37 million expansion includes 11 themed attractions and introduces Dollywood’s first ever character-driven IP. Freddy Martin (freddy@themedattraction.com) is a writer, storyteller, and independent consultant. He began his theme park voyage as a skipper on the Jungle Cruise at Disney- land. Freddy co-hosts the Themed Attraction Podcast with Mel McGowan of Storyland Studios, and is a regular contributor to InPark as well as ThemedAttraction.com. He also blogs at FreddyMartin.net.